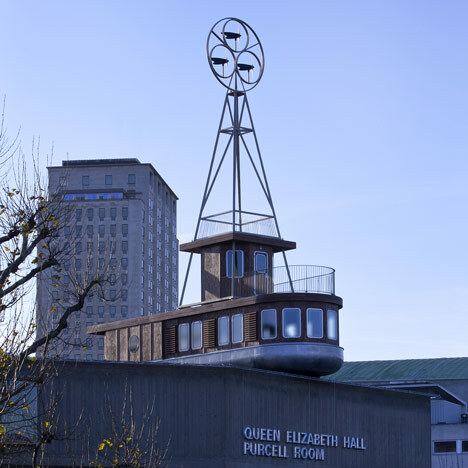 Architecture critics have been discussing A Room For London, a boat-like apartment on the roof of the Southbank Centre that will accomodate temporary overnight guests throughout 2012. Writing for The New York Times, Elias Redstone declares the project a "wonderfully surreal vision" that "originated from surprisingly practical concerns," namely the tight budget and challenging location. An account from The Guardian's Liz Bird gives an insight into what it is like to stay in the vessel. She writes: "the pièce de resistance is the snug upper deck, filled with London-themed books, which we quickly rename 'The Bridge' and where we write up the ship's log". Observer critic Rowan Moore praises the project as "an enjoyable and well-made jeu d'esprit", but warns readers not to be disillusioned into thinking of the project as an aid to urban regeneration, stating that "it is not a prototype for future Thames-side development". Contrastingly, Edwin Heathcote of the Financial Times discusses the "unheimlich" (uncanny) qualities of the rooftop apartment's nautical aesthetic, and controversially compares it to the "shocking and visceral images of the aftermath of the Japanese tsunami last year" when fishing boats were "left marooned on roofs after the waters had subsided". A few Dezeen readers got caught up in the fun aspects of the project, with one keen to "spend all day interpreting scenes from Jaws" and another imagining images from Mary Poppins - see all our readers' comments here. You can see images of the project in our earlier story here, or see more stories about the instigating organisation, Living Architecture, here.